At The Home Store, our customers satisfaction comes first. We take pride in being able to help customers throughout their entire project. In addition to selling high quality materials, we prepare customers by asking them questions and giving them information that they often don’t even know to ask. We are committed to making sure your home remodel or from scratch project goes smoothly and ends with a beautiful room that you’ll be proud to show your friends and family. While every project we encounter at The Home Store is unique, we’ve established processes that ensure customers are informed, prepared, and ultimately satisfied with their decision to work with us. Step 1: You select the door style, type of wood, and provide design input. we will take measurements from a blueprint. Step 3: We provide an initial drawing for you to review and revise. Step 4: Following your approval of the initial drawing, we provide an estimate. Step 5: You approve the estimate and give us the okay to move forward with your project. Step 6: We finalize your cabinet design, ensuring no detail is spared. Step 7: Your cabinetry is built specifically for you. Step 8: Our professional cabinet installer sets your cabinetry and your beautiful cabinets are ready for countertops. Step 1: You select the countertop material and design. 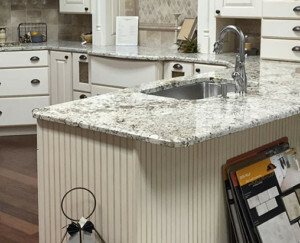 Step 2: We provide an estimate based on measurement and countertop material. Step 3: You approve the estimate and give us the okay to move forward with your project. Step 4: We come to your home and create a template measured to your specifications. Step 5: We custom cut and polish your countertops. Step 6:It’s the Big day! Your countertops are professionally installed. Granite countertops are sealed. Step 7: You stand back and enjoy your superb countertops for years to come. Step 1: We work with you to design your backsplash as part of your overall project. Step 2: You select the backsplash color and design to fit your space. Step 3: We provide a quote based on material and measurement. Step 4: You approve the estimate and give us the okay to move forward on your project. Step 5: We order the materials. Step 6: We install your new backsplash. Step 1: You work with us to select a flooring material. Step 2: We measure the space and calculate the square footage. Step 3: We provide an estimate based on the measurement and selected material. Step 5: We order the materials from a trusted source. Step 6: We install flooring in your handsome new space. that best fits your bathroom. Step 2: We estimate the cost for your shower. Step 3: You approve the estimate and give us the okay to move forward on your project. Step 4: We order the shower and prepare the materials needed to install. Step 5: We install your beautiful new shower and improve the functionality of your bathroom.